U.S. Senator John McCain (R-AZ) speaks after being awarded the 2017 Liberty Medal by former U.S. Vice President Joe Biden (unseen) at the Independence Hall in Philadelphia, Pennsylvania, U.S. October 16, 2017. 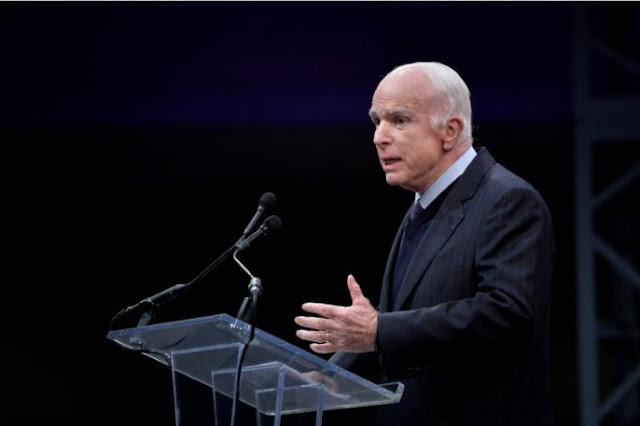 WASHINGTON - Senator John McCain, chairman of the Senate Armed Services Committee, said on Thursday he may consider issuing a subpoena because the White House has not been forthcoming with details of an ambush in Niger that left four U.S. soldiers dead. Senator John McCain, chairman of the Senate Armed Services Committee, said on Thursday he may consider issuing a subpoena because the White House has not been forthcoming with details of an ambush in Niger that left four U.S. soldiers dead.